This month’s “C” word is COMPREHENSION, which, in the “C” You In The Major Leagues vernacular includes someone who applies instruction, has a strong aptitude, makes adjustments at appropriate times, and has the ability to adjust quickly. When thinking about that definition in regards to baseball, many players and instances come to mind. There are in-game moments, when a batter hits to the opposite field and beats the shift, for instance. Then there are those moments when a pitcher understands the batter so well — and trusts his catcher so much — that he’ll make a completely unexpected pitch in an unexpected moment. 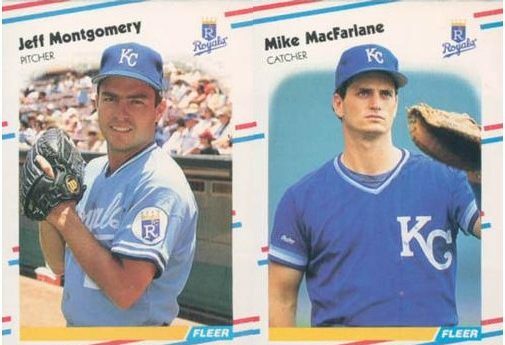 One great battery that fit COMPREHENSION was pitcher Jeff Montgomery and catcher Mike Macfarlane. Jeff Montgomery was a unique closer. He wasn’t a blow-by-hitters pitcher; more to the point, he was a four-pitch closer. And he could throw any of those four pitches at any time in the count to any batter. Catcher Mike Macfarlane, who caught more of Monty’s innings than any other catcher, had incredible confidence in Montgomery. One of those COMPREHENSION moments came against Boston at Fenway. The Royals led by a run, but the Red Sox had the bases loaded with two outs in the bottom of the ninth. Boston’s Mo Vaughn was at the plate with a full count. As Monty says from a pitcher’s standpoint, “That’s a perfect situation for someone like Vaughn.” Macfarlane called for a change-up. Now, keep in mind, out of Monty’s four pitches, although he could throw any at any time, the change-up was his hardest pitch to control. And do you really want to throw a 3-2 change-up to Vaughn? Sure enough, Vaughn struck out. Well, not only did he strike out, but he was so far in front of the pitch that at the end of his swing, his bat flew over the first-base dugout. Game over. There was another time when COMPREHENSION came into play with Monty (and Macfarlane). And remember how Monty was a four-pitch pitcher? Well, add a fifth pitch. At least for one pitch. Of course, Macfarlane had an idea. “Let’s try a knuckleball,” he said to Montgomery, who’d messed around with one, like a lot of baseball players do, but he’d never actually thrown one in a game. “After thinking about it for a second I said, ‘If we get two strikes, don’t even put a sign down and I’ll throw a knuckleball,’” Montgomery said. Sure enough, Olerud got down in the count quickly, 0-2, after lining two rockets foul. What do you need to do as a leader or as a co-worker, or a member of your family, to fit the definition of COMPREHENSION? And do you have complete trust in those around you that you can make quick adjustments to be successful?